Are you penny wise and pound foolish? Who typifies the penny wise and pound foolish person? Well, it could be someone who clips coupons for supermarket bargains, then buys all sorts of expensive deli treats during trips to that very same supermarket. Or it might be someone who takes advantage of $6.00 Tuesdays at a movie theatre, then buys $12 worth of candy, popcorn, and pop at the concession. Or it could be someone who drives for 25 minutes to an out-of-the-way gas station, then comes away with a half-cent per litre saving on fuel. As a credit counselling professional, I have to ask - is there a point to saving on smaller things here and there when you’re spending extravagantly on other fronts? Scrimping on things can be foolish, too, depending on the circumstances. In fact, cutting back can cost you much more than you bargained for, as the automotive giant General Motors discovered not so long ago. Perhaps you recall news last year about a big GM car recall. It had to do with a faulty ignition switch that could cut off engines and disable airbags, power steering, and power brakes. The company knew in 2005 that the ignition switch was problematic, but to fix it would have cost an extra 90 cents per car (eventually, the bad switch was linked to the deaths of more than a dozen people). When GM at last addressed the issue, it recalled 2.2 million cars and took a charge of $1.3 billion to cover recall-related repairs and costs. Just think, at 90 cents a car covering 2.2 million cars, GM could have initially fixed the problem for around $2 million (and more importantly could have prevented the death of more than a dozen people). My advice to the penny wise and pound foolish is simply this: look at all the angles surrounding how you economize (or believe you economize) on the smaller things in life, then compare how you economize to what you are spending on the bigger things in life, especially luxuries. Take stock of your behaviour on both levels, and you could come away with fresh awareness offering many practical benefits. The list goes on and on. You get the idea. To put the whole matter into perspective for those who may be contradicting themselves in matters of scrimping and spending - just make sure your penny wise left hand knows what your pound foolish right hand is doing. Failing that, call us here at Credit Canada. 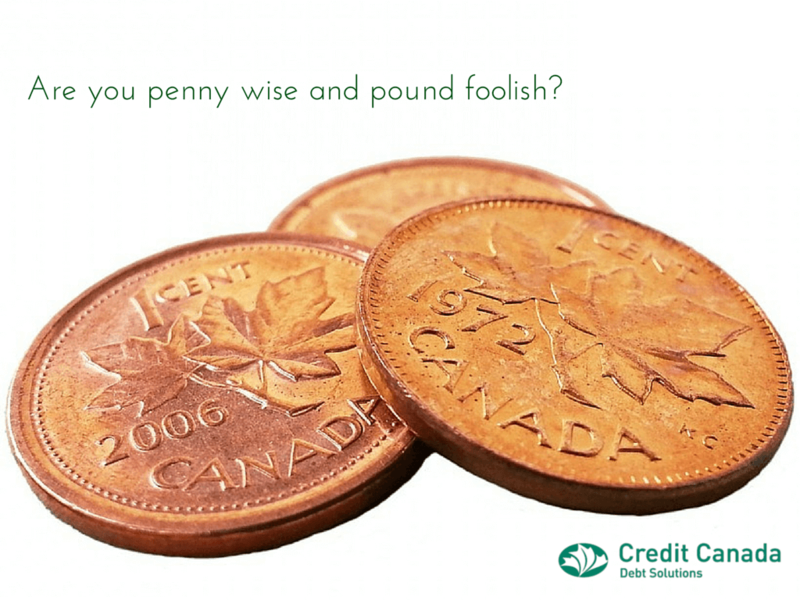 Our credit counselling services are penny wise and pound smart.